Are you experiencing pain at your neck and/or shoulder? Is this pain accompanied by pain which radiates down your arm and hand? Do you also have numbness or tingling of your arm and hand as well? If this is your situation, then you may have developed a cervical bulging/herniated disc. Physical therapy is often the first step to treatment of this condition with surgery as the last resort. The cervical spine is comprised of seven vertebrae (bones) in the neck. In between the vertebraes there is a structure called a disc which is made up of a fibrous tissue (annulus fibrosus) on the outside and a gel like material (nucleus pulposus) on the inside. These discs function like shock absorbers for your spine and help absorb forces. Involvement in an accident which results in trauma to the disc(s) or performing activities which can apply increase stresses on the disc(s) of the cervical spine can cause a disc to bulge/herniate. Natural wear and tear of the disc associated with aging can also result in bulging or herniation of a disc as well. When a disc bulges or herniates the gel like material located in the inner portion of the disc pushes out through the weakest part of the outer portion of the disc. If this occurs the bulging/herniated disc can push up on a nerve that branches out from the spinal cord and cause pain in the neck, upper back, shoulder, arm and hand. Weakness, numbness and tingling can also occur is these areas as well. 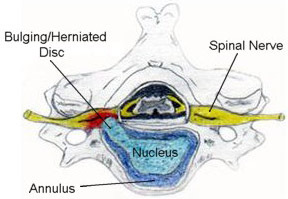 (Please refer to the illustration displaying a top down view of a disc bulging at the cervical spine which is impinging on a nerve). The discs which are most commonly affected at the cervical spine are located at the C4-C7 regions. A MRI can be taken of the cervical spine to confirm the presence of a bulging/herniated disc. Please note that the presence of a bulging/herniated disc doesn't necessarily mean that an individual will experience symptoms. However, should you have symptoms and also begin experiencing severe weakness of the arm and hand which results in the inadvertent dropping of items, then seek medical attention immediately as this may require surgical intervention. Bulging/Herniated Cervical Disc Treatment Options for a P.T.